Rocky Video Slot Guide & Review - Casino Answers! Rocky is a 5-reel, 25-line video slot developed by Playtech, featuring wild symbols, scatter wins, multipliers, a gamble feature, a free spins feature, a bonus game and more. 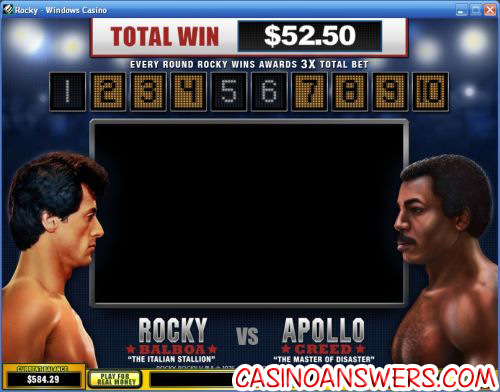 You can play the Rocky video slot at Titan Casino and Bet365 Casino. The Rocky video slot is based on the very popular Rocky movie franchise, starring Sylvester Stallone as an Italian-American underdog in the boxing world. Over 30 years, the film series has produced six movies that have grossed well over a billion dollars worldwide. The video slot spreads across much of the series, with symbols featuring Rocky Balboa, his wife Adrian, his coach Mickey Goldmill (Burgess Meredith) and opponents Apollo Creed (Carl Weathers), Clubber Lang (Mr. T) and Ivan Drago (Dolph Lundgren). The other symbols in the game include the letters that spell out “ROCKY” (which have a special purpose we will cover later in this review) as well as a Rocky scatter symbol and Boxing Glove bonus symbols. One interesting feature on the Rocky video slot is that when you get a winning combination with one of the movie characters, a short video clip from a scene in one of the movies will play. You can hear Clubber Lang call Rocky a “foo,” Ivan Drago tell Rocky “I must break you” or Apollo Creed will tell Rocky he’s going down. Before playing the Rocky slot game, you will want to set your coin size. Coin values include $0.01, $0.05, $0.10, $0.25, $0.50, $1, $2 and $5. Once you pick a coin size, you can then set your line bet at 1-10X the coin size (essentially meaning 1-10 coins). Then, if you wish, you can also decrease the number of selected paylines. The lowest total bet you can make on the Rocky video slot is $0.01, with the highest possible total bet being a stunning $1250. Rocky is for all types of slots players, from casual to high rollers. To play the Rocky slot machine, hit the “Spin” button, or “Bet Max” to play all 25 lines and 10 coins. To win the 10,000 coin top jackpot on the Rocky video slot, you must hit 5 Rocky Balboa symbols on a selected payline. The Rocky Balboa symbol is wild, therefore it substitutes for all symbols that aren’t the bonus or scatter symbols. The scatter symbol in the Rocky video slot is the “Rocky: Italian Stallion” scatter symbol. It pays out up to 100X the total bet, but it can also be used to trigger the free games feature, which includes a 2X multiplier. If you hit 3 scatter symbols, you will win 15 free spins, 4 symbols will win you 20 free spins and 5 scatter symbols will equal 25 free spins. All of these with your winnings doubled. More wild symbols are added to the reels during the free games feature. More free can won infinitely. Whenever you win in the Rocky video slot, you can choose to gamble your winnings to perhaps win yourself even more. You’ll be taken to a screen with a facedown card and two buttons – red or black. Choose correctly and you will double your winnings. Choose incorrectly and you’ll be down for the count. To exit the gamble feature at any time, use the “Collect” button to throw in the towel. You may gamble up to the double up limit, which is listed in the Paytable. In the case of Windows Casino, that double up limit is $5000. The significance of the R-O-C-K-Y symbols are that when you spell them out (each letter on a successive reel), you will win 5X your total bet. This is called the Rocky feature. Each symbol will also payout on its own. The Rocky video slot has just about everything you can look for in a video slot – a bonus game where you are guaranteed huge winnings, a free spins feature with a multiplier, a gamble feature, a large top jackpot and a theme that you can recognize and get excited about playing. On top of all of that, you can get a $4000 signup bonus to play one of the best Playtech video slots to date when you sign up and deposit today at Titan Casino! Can USA players play the Rocky video slot? 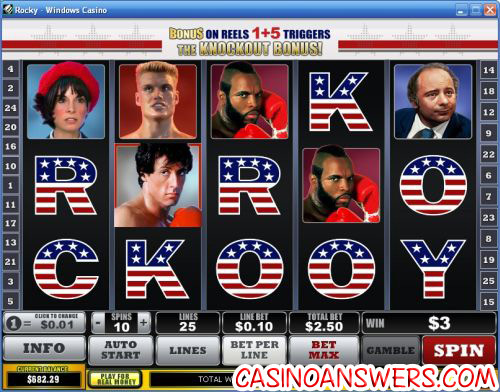 Unfortunately, players from the United States cannot play the Rocky video slot at Playtech online casinos. If you are looking for an excellent boxing-themed video slot, we would recommend that you read our Heavyweight Gold iSlot Review that you can play at the USA-friendly online casino Superior Casino. What special features are on the Rocky slot machine game? The Rocky video slot has a bonus game, a free spins feature, a gamble feature and the exclusive Rocky feature. There is also 10,000X top fixed jackpot, which is a large top jackpot for a slot game packed with this many features. Where can I find other movie-themed video slots? If it’s a video slot based on a film you are looking for, you will want to read our Braveheart Video Slot Review and Forrest Gump Video Slot Review. What makes these video slots special is they also feature progressive jackpots, in addition to many other bonus features. For more movie slots, read our list of movie-themed slots. What’s the best place to play the Rocky online slot game? Two of the best casinos to play the Rocky video slot at are Titan Casino and Bet365 Casino. For more on these great casinos, you can read our Titan Casino Review and our Bet365 Casino Review. Where can I play the new Rocky Balboa casino game?